The Talent Anarchist's Manifesto /// Free Download. Brace Yourself. Talent Anarchy /// Speakers. Authors. Catalysts. Talent Anarchy is about setting talent free — in our organizations and our lives. Setting talent free is a noisy, messy business that requires courage. A Talent Anarchist boldly stands in defiance of bad management, demanding better. A manifesto is, by definition, a public declaration of intention. 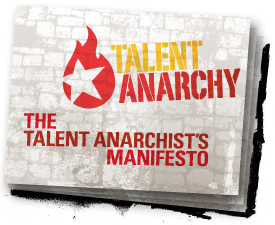 We created The Talent Anarchist’s Manifesto as our gift to you. Read it, recite it, share it. Send it to those who need a wake up call. Hang up the words that move you. Proudly declare that you are an Anarchist and that you demand change.